Research has shown that there are cultures and small groups of people around the globe who enjoy lives that extend far beyond the average. Many, such as those that live in San Blas off the coast of Panama experience less heart disease and less high blood pressure. Diet. 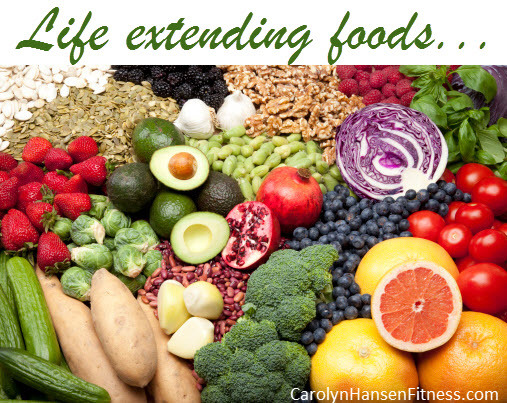 Evidence is proving that certain foods can play a role in life extension. A healthy diet does in fact contribute to health and longevity. In reverse, a poor diet will steal away your health and your years. There is no one single “wonder food”…rather it is a variety of healthy foods that are key. Here’s a short list of some of the healthiest and “live extending” foods you can eat. Salmon: This superfood is one of the best sources of omega-3 fatty acids. These fatty acids have been proven to decrease the risk of abnormal heartbeats and reduce blood pressure. They also help to slow the growth of artery-clogging fat deposits. In addition to these physical benefits, omega-3s fatty acids are considered brain food. Salmon is particularly rich source. Yogurt: Offering probiotics. Similar to the friendly bacteria already living in your gut, probiotics help you digest and absorb nutrients from the foods you eat. They support your immune system and protect you against disease. Effective in preventing certain types of cancer, they are used to treat other health conditions such as urinary tract infections. Blueberries: Rank at the top of the list for disease-fighting foods. In addition to the healthy dose of vitamins and minerals offered, they are loaded with antioxidants. These warriors are powerful enough to reduce the risk of certain cancers, stroke, heart disease and age related brains diseases such as Alzheimer’s and Parkinson’s. They also help to decrease inflammation while guarding your cells from damaging free radicals. Dark chocolate: This does not include the overly processed sugar laden types of chocolate you might find on your grocery shelves. It is the higher grade dark-chocolate that offers antioxidants called flavonoids. Favonoids help support your heart and blood vessels. Keep in mind that calories and fat come along with the package, so treat yourself gingerly without over doing it. Kale: Rich with vitamin K, essential for blood clotting, this superfood also contains lutein. This nutrient reduces the risk of cataracts and other eye disorders. Kale even trumps spinach with triple the amount of vitamin K! Leafy Greens/green veggies: Kale isn’t the only leafy green contributing to extended years. These healthy, nutrient dense super-foods should be the cornerstone of all healthy eating plans. They are packed with an assortment of vitamins, minerals and protein. As nature’s most alkaline foods, they are readily available to us. Swiss chard, broccoli, collards, herbs and spinach are all great choices. They not only help to prevent disease but have proven effective in reversing some major health issues. Genetics can predispose us to different diseases. However, we do have a certain amount of control when it comes to our health. Our dietary choices are among the most influential factors. These choices effect how we age, how long we live and the quality of the years in between.